Vegetarians and squeamish readers of this blog should once again avert their eyes. Here in Asia we live by one motto: never buy a dead chicken. 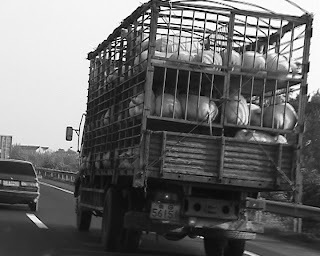 The result is that live chickens get moved around on the backs of trucks, trikes, scooters and bicycles. 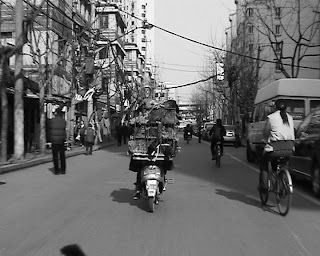 These guys are headed for the market beyond that bridge at the end of the road and that chicken on the top knows it. Hear him make a last request for a blindfold – or was that a Double Happiness cigarette?